← Reviewing the past road trip days that have been – awesome…:) and returning to reality..
January 4, 2013 – 6:15 AM I drove out of the Betts’ house at 152266 miles on my truck from Seaford, DE to head to Delaware – before too long I heard the fated NPR broadcast about 3 Kings Day – let me explain – Rosca de Reyes – a bread I thought that was like fruit cake – no no way at all, the three colors represent the three kings, and inside the bread you might stumble across a small baby – if you get this as you are chomping, you get to host the party NEXT year 🙂 It is one thing to hear this but another to be in a country that lives this, and that has made all the difference in my and realizing what people Mexico is and what Mexico is – and again, the stories versus the reality I thought as I listened to this NPR broadcast, made me realize what a gift it has been to be in Mexico on a personal level. 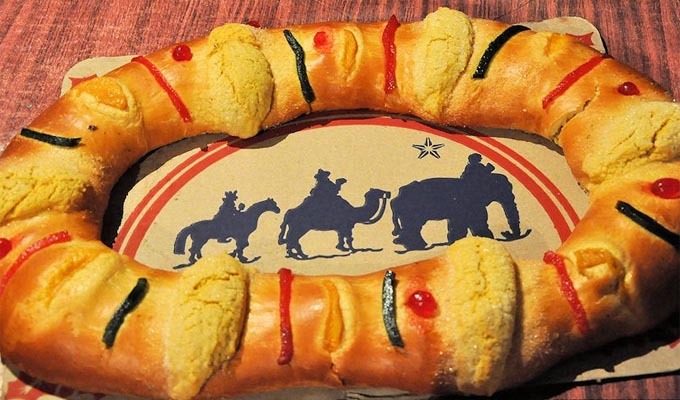 In this NPR broadcast, if you clicked on the link above, told you there was a TEN – yes, 10 ton, that is TON Rosca de Reyes bread being made, SUPER WHOA…. I remember after hearing this shocked of the irony if being pulled back to my home now in Mexico in a single broadcast – as I pulled into Bridgeville and bought gas – 3.36 a gallon, filling up with the remaining 5.96 gallons that filled my Mountaineer tank, costing me 20.00. Virginia – the state I LOATHED driving TO Seaford as it took forever – I stopped at 152381 mileage and bought 5.716 gallons at 3.49 (OUCH) a gallon ouch as you will see how far down it dips as I travelled further south…this cost me 20.00 as well. Yet to show how big Virginia was, I stopped AGAIN in the state to take advantage of the 3.29 a gallon, costing me 50.00 getting 15.156 gallons – so this would let me get OUT of the state and fill up next time in…um no – STILL in Virginia – getting the 3.18/gallon for 15.00 at WAWA gas station, 5.332 gallons, and mileage 152487 – moving along as you can see with the mileage – and yes, an UNBELIEVABLE FOURTH time in VA, getting gas, AGAIN, at Sheetz (did I mention this was in VIRGINIA?) – 3.15/gallon for 6.963 gallons for $22.00 and mileage at 152591. Finally – Tennessee – 20.00 spent for 3.09 a gallon, 6.454 gallons, at HESS, mileage 152703 – then again in TN – getting 8.145 gallons, 3.06 a gallon, at 152820 mileage. Last time in Tennessee I bought 8.771 gallons at 3.07 a gallon, for 27.01, mileage 152973 27+ miles out of Chattanooga. Hitting Alabama – Same day! – whoa! YEAH! – I bought my first time in this state, 24.00 of gas, for 3.15 a gallon, giving me 7.596 gallons at 53096 mileage. I gracefully used my brother’s Visa gift card to fuel me to get to my next stop, still in Alabama, stopping at 11:44 PM – completely EXHAUSTED – and falling asleep in the back seat of my truck, not liking the COLD – but lucky to have the body pillow from the Fields! – and blanket I still had from attending Edinboro University AGES ago – locked inside my truck at a truck rest stop. I awoke at 3:33 AM and something told me – GET TO Mississippi! – I drove until 4:14 AM, which did in fact take me into Mississippi, where I found a rest stop and again, found deeply asleep at a rest stop, obviously now into the second day of my trip. When I woke up – I filled up with $25.00 of gas, giving me 9.618 gallons as 3.119 a gallon, yes, prices were now definitely lower! My mileage was 153282 at this point, and I heard this AWESOME broadcast as I crossed into Louisiana – about “Fess”, an AMAZING inspiration to Louisiana music and would go on to influence MANY other famous musicians, – Profess long Hair – if you do not know this story – TRUST ME – you NEED TO LISTEN TO THIS, this is AMAZING – I promise you – and I again dawned on the irony of listening to NPR’s story about this Louisiana legend as I drive through Louisiana, making me realize how much more there is to states than just driving through them. I also realized all the things I was seeing abandoned along the road, a brand new cooler in the middle of the road, with a brand new top, a back hat with a pin band (reminded me of an episode of Two and a Half Men and Steve Tylor). Eugene Doyle. Born 19 June 1972. Died 17 December 2010,aged thirty-eight. I was hooked by her thick brogue, and the plot of how such a story came out in the first place, and if you listen to this you will run out and snag this book – I wanted to right there and then. Finally – FINALLY – Texas – getting 13.337 gallons of gas, at, YES – 2.99 a gallon, for 40.00, at mileage 153703, I KNEW I was getting closer to my second night. Three more stops would have me for gas in Texas, next one at 20.00 for 3.15 a gallon receiving 6.331 gallons at mileage 153814 mileage, then again for 28.00, 8.752 gallons, at 3.19 a gallon, at mileage 153965 mileage. Lastly – IN LAREDO! – 3.15 a gallon, 9.813 gallons, at mileage 154149. I have to say, calling my cousin Roger with the remaining 2 minutes left to bypass Houston and San Antonio, using a state route instead of an interstate did cu bout (was it 40?) miles off my intended route – thanks Roger for researching this as I was approaching the choice to take interstate versus state routes – I found the Holiday Inn parking lot, fell asleep exhausted, and awoke at 7:30 AM – ready to start my trip across the border. Let me say this – I had the worst anxiety attack of my life this Saturday night – Would I make it all the way and have enough money? What would I do if I did not? Was I truly going to be able to leave the awesome moments I had with my family and be able to go back to my changed world in Mexico? I did not sleep well this Saturday night and never had these fears hit me as they did this evening and that placed me in a zone of fear I had not been in a long time, maybe it was just being night ad being so far away so quickly, but all the same, this experience certainly was unsettling. LIBRE = Free Road. Free roads are less well maintained, single-lanes each way that will take you longer to travel across. However, to see some of the ‘off the beaten track’ places, you’ll need to avoid Toll Roads, as they often double as “by-passes” (see term below). It’s recommended that you don’t take the free roads after dark. CUOTA = Toll Road. Follow this sign if you want to take the toll road to the destination you are traveling to. Note that the highway numbers are often the same, so you can be on the right highway number, heading in the right direction, but on a free (slower) road than you’d like to be. For toll roads, follow the signs that read “CUOTA”. LIBRAMIENTO = Bypass. Sometimes, major free roads that connect big towns and cities will give you an option to take the “Libramiento” route. This is like a toll road (and sometimes it’s part of the toll road) which, for a fee, will enable you to by-pass the smaller town city if you don’t want to go there, saving you time, and perhaps the hassle of getting lost. Libramientos work in the same way as toll roads. My 6th toll was 55 pesos, at 12:05, then finally, 5 miles before San Cayetanos, I pulled over and bought 500 pesos of gas, my first close to fill up in Mexico. Mileage 154448. I have to say, this fill up barely put my gas to the half tank and I was not happy with the results of my gas fuel line, bringing back my haunting fears of IF I would make it. 7th tolls became San Luis Postosi – 19 pesos, then 8th toll, then shortly after I stopped again fro gas, 500 pesos and THIS fill up DID fill up my tank, giving me MUCH more gas, for the same 500 pesos? I was totally stymied and wondered why I had been so short fuel the first time? Watered down? I watched them pump it and I did not receive NEARLY the same gas level I did, but same Pemex station, so was there THAT much of a difference in price per gallon? I should have noted it, but since people always pump your gas for you, it was not as easy to gather this info. At 4:32 I was in Queretaro, Mexico, toll of 52 pesos, (8th toll) mileage 154596. I pushed on and my 9th toll was 40 pesos just outside Queretaro. 10th toll was 80 pesos, at 7:17 PM, mileage 154750, an last (MY GOSH LAST!) toll was 70 pesos for the Federal District (or the DF) – 8Needless to say, I arrived home around 11:10 PM, not before coming lost as I came in under and among these NEW satellite overpasses and by TOTAL luck, saw the exit for Viaducto Miguel Alemán, I took it, and ended up by the World trade Center and just made it home, in a major daze from sore muscles, still not believing I was DONE driving as I walked up the stairs to my own apartment. Overall, I found I drove 55 miles to 60 miles an hour halfway in Mexico to save gas, and I did get a ton of mileage that had lasted me from fill up all the way to deep into Mexico, yet when I went 65-70 the second half – I did not burn any more fuel, so I felt I could have gone a little faster and arrived faster – but I never would get a chance to test if one was better than the other, though I have to say, I am done THAT test is over. This was a three day trek back and forth that certainly is a test, my back and legs still feel, just “accordioned”, yet, what is sad is when/if I am brave to do this again, I will always know I can do it in three days and any more will seem like I am losing time, so yes, this set a bar I didn’t necessarily want to look at the next time!